Discussion in 'Official News & Announcements' started by MightyZug, Jan 30, 2018. Thank you for your hard work, team! David Mendez Gurra likes this. David Mendez Gurra and Brian Ford like this. We're going to be releasing a new update within the next week with a handful of minor updates - check out the list below to see what's coming down the pipe! We've sped up the infamous Syncing Downloads... portion of the initial startup flow. You should be able to get into the game faster than ever! We heavily simplified the Login Flow to make it easier and less confusing for new and returning players alike to get into the game or to recover their old LINE account data. Instead of just staring at text while you wait for the client to fully download data from the server, we've added a bunch of fancy art from the console game for you to check out! If you're feeling impatient, you can tap the screen to advance to the next image. We got a lot of feedback from folks that suggested that it wasn't 100% clear that each of the Offers in the store contain a LOT more than just the "featured" Relics that are displayed on the banner. As such, we've updated the banner to include a mini-preview of all the fun stuff that you'll get! 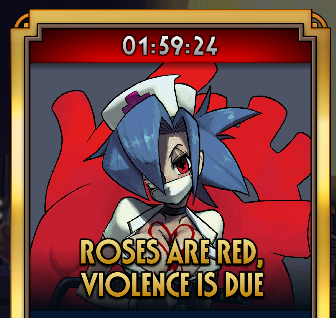 Valentine wouldn't let Valentine's Day pass without a little something special - keep an eye out for a special Prize Fight on Feb 14th! Fixed a bug in the $19.99 Fighter Pack offer that was granting 400,000 Canopy Coins instead of 40,000 - whoops! Once the app is approved, there will be some brief server downtime - we'll do our best to get everything up and running again ASAP! Keep an eye out in mid-February for a forum post on our next (bigger) 2.1 update! Thanks as always for your support - let us know if you have any questions in the comments below! Any chance more from 2nd Encore is making its way to the mobile port by any chance? By the way, are you going to put ither characters like Fortune, Robo Fortune or Squigly? Brian Ford and Christine like this. what’s this new PF tomorrow huh? Will 2.1 be delayed due to recent events? @moisterrific It certainly didn't help! We're in the process of re-evaluating our previously planned release cadence in light of recent events - I hope to have something to share by the end of the week so you all know what to expect in the near future. David Mendez Gurra, Psyche, RedRidingHoodie and 10 others like this. When is the next update coming out? Can we have at least little info for the upcoming patch? Also will there be an end game type game mode because repeating prize fights is getting too repetitive. I imagine that the recent issues with the SGM servers means Hidden Variable have had to push back update plans a little bit. Having said that, there's probably news coming about an update soon enough, so just hang in there a little bit more! David Mendez Gurra and Psyche like this. CONTENT FOR END GAME PLAYERS - We know there are those of you out there with max L50 Gold Characters in abundance - we want to make sure there are fun, rewarding challenges that have been built with you in mind! SOCIAL FEATURES - Ever since the beginning, we’ve always had plans to add new social features to Skullgirls. Now that we no longer need to address LINE restrictions, we can begin building friend lists, chat, “guilds”, and supporting cooperative / competitive modes to go along with it! And if you click the little arrow on that quotation box, it should take you directly to the thread so you can read the rest. Of course, many of these things will take a lot of time and effort so they are a while away yet.